Selecting shrubs and trees for you lawn or landscape is a crucial task. Choosing the right shrubs for your climate, soil type and sunlight exposure can greatly impact the amount of maintenance demands that the shrubs will have for years to come. Evergreen shrubs that are suitable for Minnesota landscapes will first and foremost need to be very hardy, tolerating winter temperatures as low as -40 degrees Fahrenheit. The emerald green arborvitae (Thuja occidentalis ‘Smaragd’) is well adapted to Minnesota’s climate, growing up to 15 feet tall and attaining a conical shape. Emerald arborvitaes are also extremely versatile, growing in most soil types, but preferably in well-draining soils, and in spots that receive full sun to full shade. These evergreen shrubs are often used to create tall hedges, privacy screens or windbreaks and can grow throughout Minnesota. The emerald green arborvitae requires little to no pruning and has bright-green needle foliage. The Korean boxwood (Buxus microphylla koreana) is the only type of boxwood that’s hardy enough to grow in Minnesota, and features broadleaved evergreen foliage that turns from olive to purplish-green or yellowish in winter. The Korean boxwood needs some shade in winter and grows up to 2 feet tall and 3 feet wide. You can plant Korean boxwoods as individual specimens or as part of low-growing hedges and borders. Like the Korean boxwood, the rhododendron is a broadleaf evergreen that’s hardy enough for Minnesota’s climate. 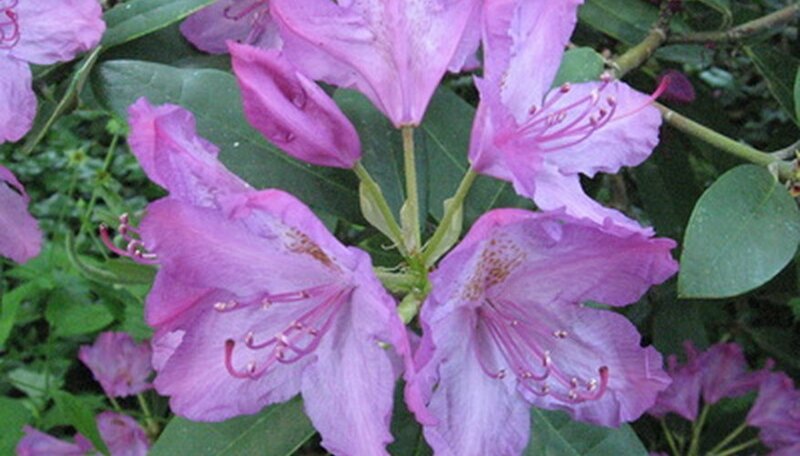 Rhododendrons bloom in showy, large purple to pinkish flower clusters in spring and early summer. These shrubs have large, oval to oblong, leathery leaves that retain their medium-green color year-round. Most rhododendrons grow up to 8 feet tall and wide, adapting to most soil types and growing in areas with full sunlight to partial shade. Although some rhododendrons are deciduous, the Catawba rhododendron (Rhododendron catawbiense) and the PJM rhododendron (R. ‘PJM’) are both evergreen species that grow well in Minnesota. Both shrubs have lavender flower clusters and grow 3 to 4 feet in height and width, although the Catawba species can grow only in the southernmost part of Minnesota. The Japanese yew (Taxus cuspidata) is a spreading shrub that usually grows to around 5 feet tall and wide. Preferring partial to full shade, Japanese yews are perfect for the areas in Minnesota landscapes where few other plants will grow. The shrub has dark-green needles, a compact and spreading form, and red berry-like fruits emerging in fall. The skyrocket juniper (Juniperus ‘Skyrocket’) is an evergreen shrub that grows best in the southern portions of Minnesota and reaches 15 feet in height. This juniper shrub has a slender, narrow shape, growing to only 2 or 3 feet wide. The needle foliage is bluish-green year-round and requires little to no pruning. The skyrocket juniper shrub can grow in nearly any type of soil and in full sun to partial shade. Skyrocket junipers are low-maintenance shrubs that are often planted in landscapes as foundation plantings, as individual specimens or in shrub beds.